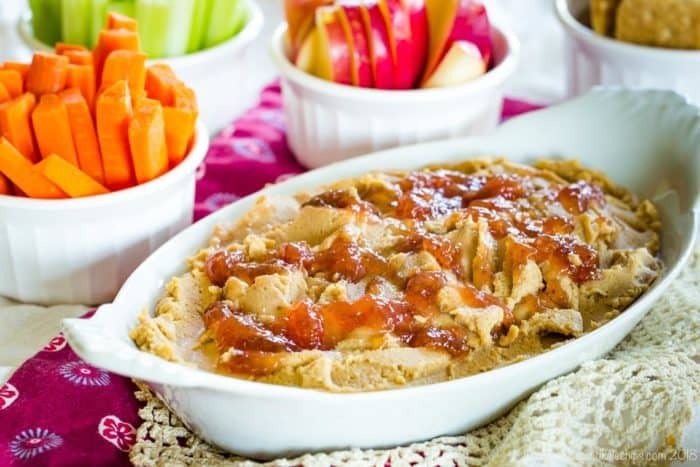 PB and J Cookie Dough Dip is a flip on the classic combination of peanut butter and jelly, creating a fun and healthy snack. This is a gluten-free flourless cookie dough dip recipe! 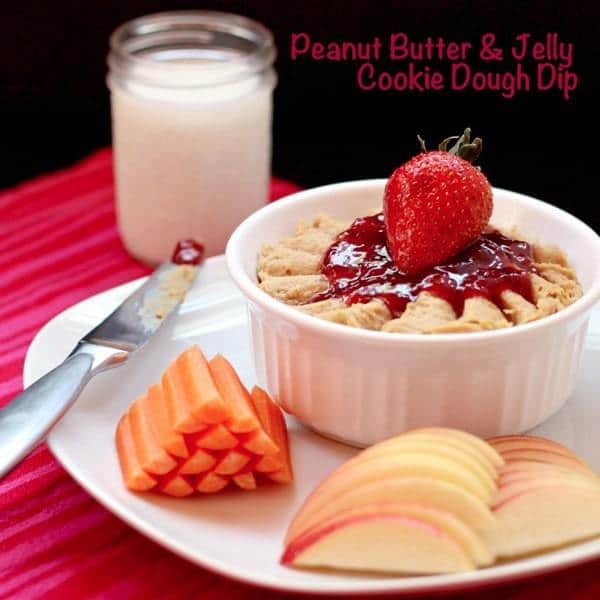 PB and J Cookie Dough Dip flips the classic combination of peanut butter and jelly, turning it into a fun and healthy snack. This flourless cookie dough dip has a secret ingredient that makes it naturally gluten-free and vegan. You’ll love this recipe, and all of my easy gluten-free dessert dips. So back to the classic combination of peanut butter and jelly. I actually wasn’t one of those kids who ate PB and J all the time. I think my insane passion for peanut butter actually came on fairly recently. And of course, since I had to cut down on “normal” (meaning not gluten-free) bread, I crave PB and J on whole wheat bread pretty much on a daily basis. 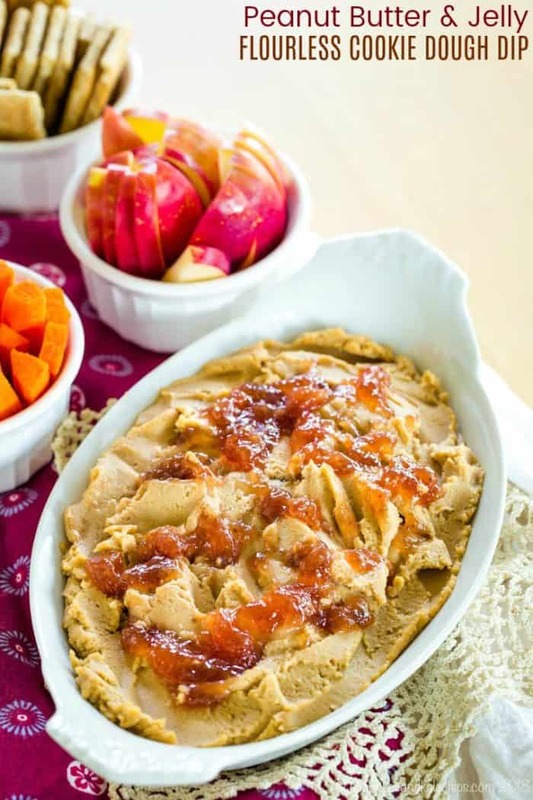 I want to cater to my gluten-free, and even vegan crowd with this PB and J cookie dough dip. 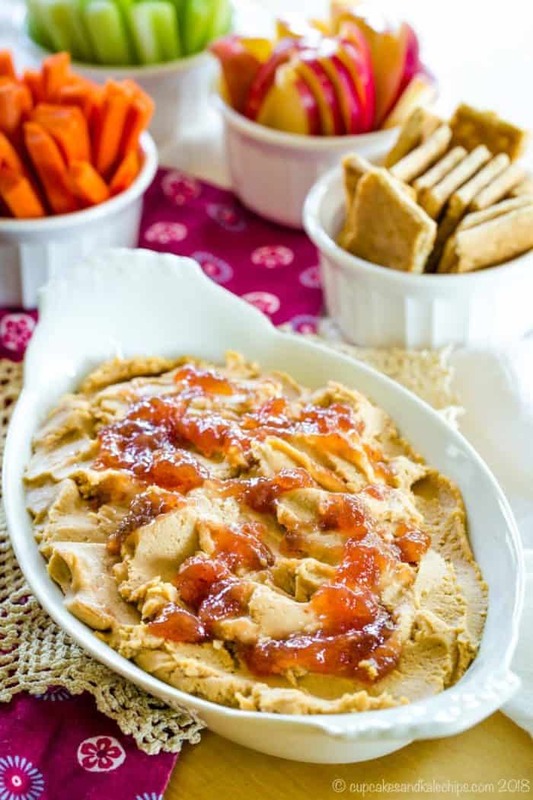 The recipes I’ve seen for “cookie dough dip” or “dessert hummus” are my inspiration for this flourless PB and J cookie dough dip recipe. This easy hummus dip recipe uses some basic pantry ingredients and tastes just like peanut butter cookie dough. But, without the risks that come with eating raw cookie dough (not that I have ever done that myself). 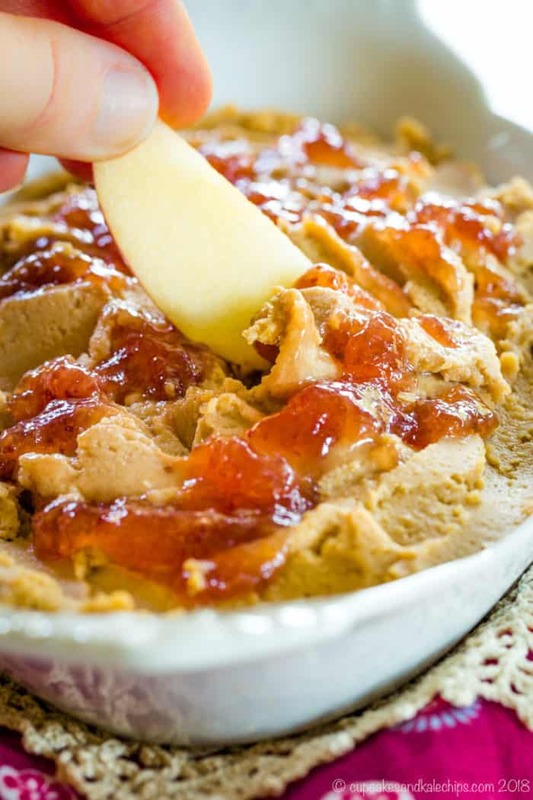 Add a little jelly, jam, or preserves on top for some sweetness to balance the salty peanutty-ness, and you have all of the yumminess of a classic combo, but with a new twist. I use Smucker’s Orchard’s Finest Pacific Mountain Strawberry Preserves because I love my PB and J with strawberry “J”, and I wanted a little chunkiness, which comes from using preserves instead of jelly. But you can use whatever is your favorite. Here’s a little fun, foodie knowledge about the classic sandwich that everyone loves! How was PB and J invented? The popularity of the common-day peanut butter and jelly sandwich has roots dating back to the 1920s- the invention of sliced bread. Prior to that, in 1901, a woman named Julia Davis Chandler first created the combination. Is cookie dough dip gluten-free? 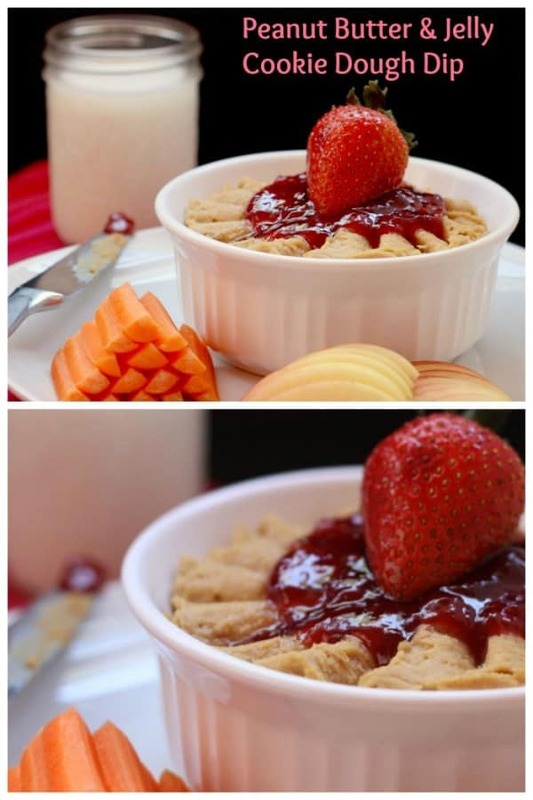 While not ALL cookie dough dip recipes are gluten-free, this PB and J cookie dough dip IS gluten-free. Because it isn’t actually cookie dough, but rather hummus in disguise, this is also a healthy cookie dough dip! For dipping, serve some apple slices or carrot sticks. Or smear it on some crackers, rice cakes, pitas, or bananas. Add a glass of milk (or almond milk), and revisit your favorite childhood sammie memories. 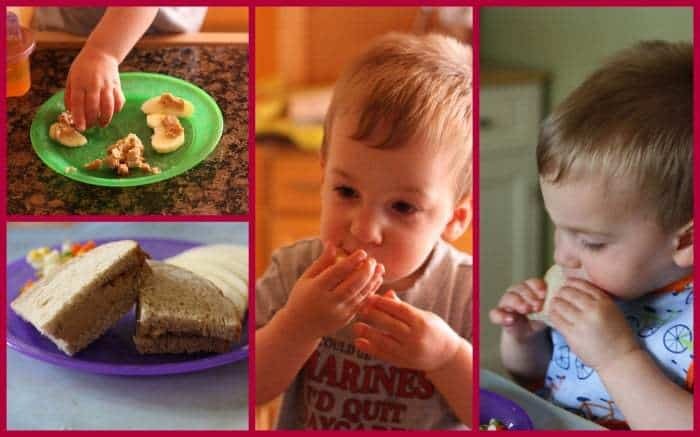 Speaking of childhood, this is a tasty, healthy, and fun recipe for kids, too. The Bug loves it for a snack on some apples, and on a sammie for lunch! In fact, a minute after I took the picture of him eating the sandwich, he proceeded to take the bread off, just to eat the PB and J hummus. For my kid to eat anything in lieu of bread, you know it must be good. Oh, and then he ate his veggies – after I put homemade ketchup on them. 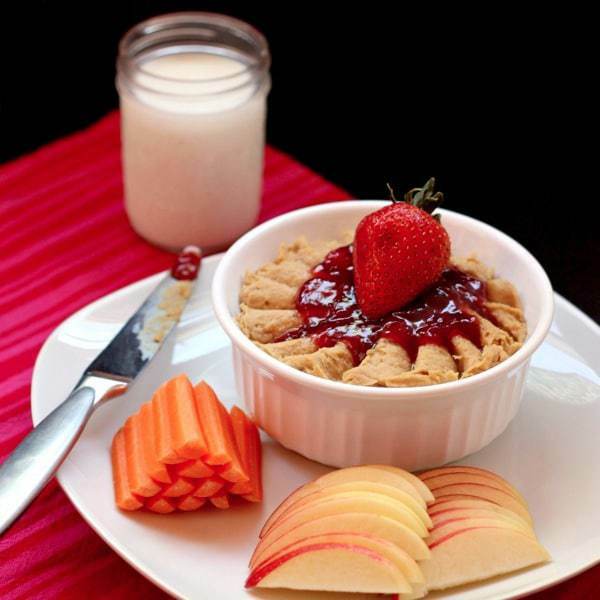 You can always start your meal with Peanut Butter and Jelly Oatmeal from Barefeet in the Kitchen. 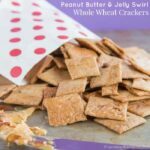 Enjoy Flourless Peanut Butter and Jelly Cookies as a snack from Sugar Free Mom. Or indulge your sweet tooth in a healthier way with Peanut Butter and Jelly Fudge from Texanerin Baking. 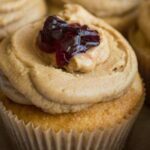 You can also check out these 18 Peanut Butter and Jelly Recipes to Channel Your Inner Child. You really can’t go wrong with a healthy hummus snack that tastes like cookie dough dip and a child’s favorite sandwich! Place the chickpeas peanut butter, and honey in the bowl of a small food processor or blender. Pulse a few times to start chopping and combining the ingredients. Add 2 Tbsp of your desired milk, and continue to puree until smooth and blended, adding more milk, if necessary, to achieve your desired consistency. 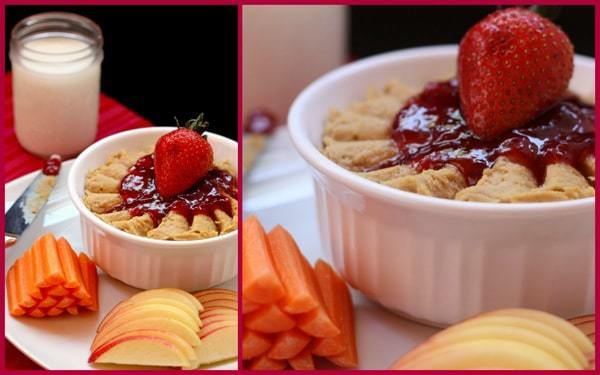 Place the "cookie dough" in a bowl, top with the jam, jelly, or preserves, and swirl it in a bit with a knife. Dip, smear, spread, or spoon to your heart's content. This sounds AMAZING. I’m making it this weekend, and adding dark chocolate chunks…because…peanut butter cups!! I think I’ll use strawberries to dip – YUM. Thanks for this awesome recipe! Your idea sounds fantastic, Lisa! Let us know how it turns out! Tried it…LOVED it…have to stop thinking about it or I will eat the entire bowl in one sitting. The dark chocolate is perfect, and I added a tiny bit of cinnamon too. Great with strawberries, pretzels, probably would taste great on a brick LOL. Thanks so much for the great idea! I’m so happy to hear that you love the dip, Lisa. Thank you for your comment and rating of the recipe! Thanks! Haven’t made it in awhile! I’ll have to make it again! Thanks for hosting! I am happy to be a part of the group. So many of the recipes looked yummy! This looks like somebody loves it. Thanks so much for sharing at Whimsy Wednesdays. To tell you the truth, I had issues with my mini-processor because it is kind of a crappy one. I have never liked crunchy peanut butter, so I used creamy. Hope he loves it! That is such a cute idea! And I’m sure it can easily be made peanut-free with another nut butter. Thanks for sharing this week at Allergy-Free Wednesdays! As always, hope to see you back again next week. Thanks! Yes, I just got my first jar of sunflower butter. I’d be interested to try it with that. I followed you over from whimsy Wednesday Link Party and this looks and sounds incredible! Thanks for stopping by. I’ll be sure to come by and share tomorrow. Thanks so much for the invite! A little extra protein and fiber is always good! This looks so good! Being newly GF, it is great to see a new idea for something to eat! I can’t wait to try it. Thanks for the recipe! I have been trying to be more diligent about being gluten-free. I don’t have celiac, so don’t have to be 100% gluten-free, but it does make me feel better. So you’ll see many of my recipes are gluten-free. I am experimenting with a flour mixture and some baked goods, so stay tuned in the coming weeks. Thank you! I was thinking that graham crackers might be good, maybe even the chocolate ones. Sounds strange, but it is really yummy!! This dip looks really good! What a great idea. Thanks for sharing at Showcase Your Talent Thursday. I hope to see you there next week! Thanks, I’ll see you next week! Thank you! And I am going to check out your macarons now. I missed those. Thank you! I was trying to think outside the box. Or actually, outside the sandwich. What a truly creative recipe, Brianne!! I love this! If Maddy could eat peanuts I’d be all over this. You did an excellent job. And I don’t think I got to comment on your post last month but welcome to Improv! I rarely get to comment on others blogs as often as I want to. I have such limited computer time! Anyway, I’m babbling 😉 Great recipe!! Thanks! I bet it would work with other nut butters, too. I just figured that since hummus has tahini, peanut butter would be easy to sub in. Maybe that sunflower seed butter? I haven’t tried it yet, but I have a jar. Thanks! Yes, I think it is a fun new snack for kids. The Bug had it for lunch again today! This recipe looks awesome! I love using chickpeas in sweet recipes. I would love for you to link it up to my Recipe Party at The Sweet Spot. Thanks for stopping by and inviting me to your link party. I’ll link up on Sunday for the start of the new week! Oh I hope you guys love it! I was a grape jelly fan as a kid, but as an adult, I’ve switched to strawberry. Just pinned this one–you are so creative! 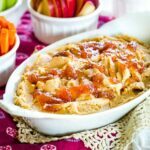 Apples with peanut butter are one of my favorite afternoon snacks & it would be so easy to whip up a batch of this and have it with the apples instead. And yes, I just left you a comment with my old blog URL too. It’s going to take me forever to remember to change it! Thanks! I eat apples with peanut butter all the time. It is one of my favorite snacks, so this is a fun twist with a little more fiber and protein. Thank you – he was definitely a big fan! But he loves anything with peanut butter. Yep, that’s what I did. Since the piece on the base and for the background are the same color, they blend well. Too bad Tastespotting is still rejecting me. Still waiting on the others. Wow…Top shelf and pretty innovative, cant wait to try this. Thanks. It is definitely going to be part of the regular rotation here. 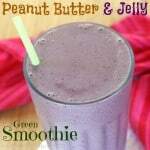 What a neat way to make PB&J…my most recent spin on the combo was pb&j cups. I saw the PB&J cups – I had actually thought about doing something similar before I saw that, but then I came up with this idea. I went through a Ham & Cheese rut. On potato rolls. Yum, this looks delicious! Great recipe! Thank – I figured, since hummus has tahini, and peanut butter is similar in texture to tahini, it would work. And it did! My 3yo loves pb&j like no one else I know. She would love this dip! Thank you so much for sharing it! Yum! I hope you give it a try. Provides a little more fiber and protein than a straight PB&J, so I thought it would be a great idea for lunch or snacks. Thanks! Can’t wait to check out your tart. That is SO cool! I’d like to dive right into that dip. I cannot believe it starts with chickpeas!! Thank you so much. I am diving into it right now 🙂 You don’t even get the chickpea flavor – just a doughy texture.